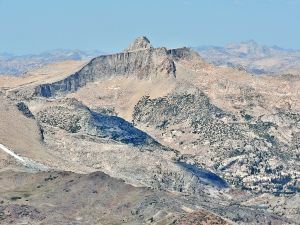 This peak is #54 in Prominence List for California .Mount Conness is located on the Sierra Crest just north of Tioga Pass. Its northeast face features a steep rock wall and several pocket glaciers. The south slopes offer a non-technical route to the summit. There are numerous technical rock routes on the north and east flanks.